Origin and Habitat: Eastern Cape through the former Transkei, KwaZulu-Natal, Swaziland and Mpumalanga; and northwards to Mozambique and East Africa. Habitat: It occurs in wooded ravines in subtropical coastal forests and dry valleys in the summer rainfall eastern regions of southern Africa. The climate is mild and rainfall is at least 1000-1500 mm per annum and with little or no frost. The seeds often germinate in the shade of mother plants and eventually outgrow them. The soil is usually a loam and humus rich. Aloidendron barberae (Dyer) Klopper & Gideon F.Sm. 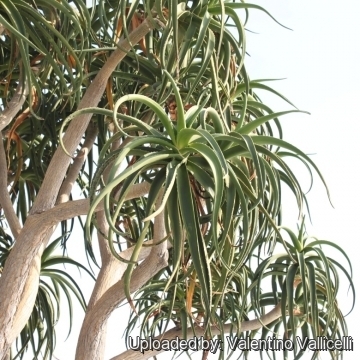 Description: The South Africans tree aloe Aloe barberae ( known for many years as Aloe bainesii), is a small to medium-sized, much-branched tree with a massive trunk and high rounded crown that can take a variety of shapes and sizes. 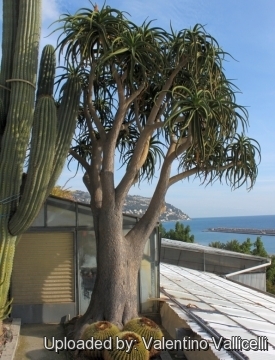 In its native land this slow-growing tree can reach 18-20 m high. It is widely used as an ornamental plant in tropical and Mediterranean gardens and can certainly be described as a timeless classic. 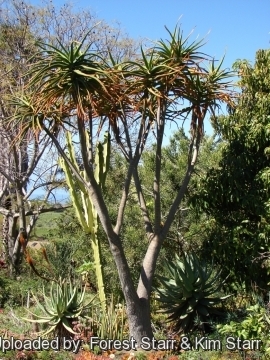 Aloe barberae is Africa's largest aloe. Stem: Trunk, single, erect 0,9-3 m in diameter, copiously branching dichotomously (either two or three-forked). The bark of the tree trunks is greyish-brown and rough to the touch. The branches are long, arm-like, tapering, naked, and sprout rosettes of long and narrow leaves at their ends. Leaves: About 20 per rosette, 60-90 cm long, 7-9 cm broad, deeply channelled, recurved, dark green, spineless on both surfaces. Margin edged with a whitish line and small brown-tipped teeth, that are, firm horny, 2-3 mm long and 10-25 mm apart. Inflorescence: 40-60 cm long, erect, simple or divided into three side branches (mostly 2-branched). Racemes cylindrical, slightly acuminate, 20-30 cm long and 8-10 cm in diameter, dense. Bracts linear-acuminate, 10 mm long, 1 mm broad. Pedeicel up to 10 mm long. Flowers: Tubular, rose-pink or oran ge (Maputaland coastal form) and green-tipped 33-37 mm long. Base rounded. Tepals free for 28-32 mm long. Stamens exserted 15 mm long. Blooming season: It flowers in winter (June and July in habitat) and in its natural environment is pollinated by sunbirds. Fruits: Dry capsules. The capsules ripen during late spring and release their seed which is wind dispersed. Notes: This species was previously known as Aloe bainesii Dyer, a name published in the same paper as Aloe barberae. A few months later Dyer published a note in which the 2 taxa were united, and he chose A. barberae as the name for the united species. This later note was overlooked until attention was drawn toil by Smith & al. (1994). In accordance with ICBN Art. 11.5, Dyer's choice of name must be used. 1) 1) Forest & Kim Starr “Aloe barberae (Tree aloe)”. Plants of Hawaii. <http://www.starrenvironmental.com>. Web. 27 Sep. 2014. 4) Susan Carter, John J. Lavranos, Leonard E. Newton, Colin C. Walker “Aloes. The definitive guide” Kew Publishing, Royal Botanic Gardens, Kew 2011, ISBN 978-1-84246-439-7, S. 251. 5) Court, D, 1981. “Succulent flora of Southern Africa” Balkema, Cape Town. 6) Germishuizen, G. & Meyer, N.L. (eds) 2003. “Plants of southern Africa : an annotated checklist.” Strelitzia 14. National Botanical Institute, Pretoria. 7) Jackson, W P U, 1990. “Origins and meanings of South African plant genera” UCT Ecolab, Cape Town. 9) Leistner, O.A. 2005. “Seed plants of southern tropical Africa” SABONET, Pretoria. 10) Nichols, G. 2005. “Growing rare plants, a practical handbook on propagating the treatened plants of southern Africa” Southern African Botanical Diversity Network Report No. 36. SABONET, Pretoria. 11) Reynolds, G.W. 1950. “The aloes of South Africa” The Aloes of South Africa Book Fund, Johannesburg. 15) Ben-Erik Van Wyk, Gideon Smith “Guide to the Aloes of South Africa” Briza Publ., 1996. 16) Smith, C.A. 1966. “Common names of South African plants.” Memoirs of the Botanical Survey of South Africa No. 35. 17) Van Wyk, B.-E. & Gericke, N. 2000. “People's plants. A guide to useful plants of southern Africa” Briza Publications, Pretoria. 18) Van Wyk, B-E. & Smith, G. 1996. 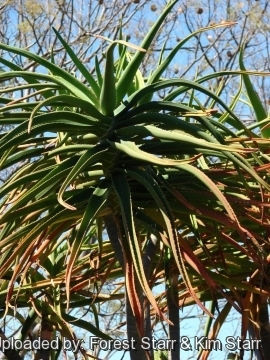 “Guide to the aloes of South Africa” Briza Publications, Pretoria. 19) Keith, Paul & Meg Coates Palgrave. “Algemene gids tot BOME” 2000. 21) Smith, G.F., Van Wyk, B.-E. & Glen. H.F. “Asphodelaceae/Aloaceae: Aloe barberae to replace A. bainesii.” Bothalia 24: 34–35. 24) Smith,G.F. et al. “Aloe barberae to replace A.bainesii.” Bothalia 24(1)34-35. 1994. Cultivation and Propagation: Aloe barberae is an attractive and interesting accent plant to have in a sunny garden. It easy to grow and suited for any well drained soil in full sun. As such it is increasingly used as an ornamental plant for drought tolerant landscaping and rockeries. Growing rate: It is fairly fast growing, but should be well watered and enough compost provided for optimal growth. It is able to increase its height by 10-30 cm per year under favourable conditions. It is a long lived plant and once established, it will be content in its position and with its soil for years. It is often in danger of being overgrown, smothered and killed by faster growing plants in its vicinity. 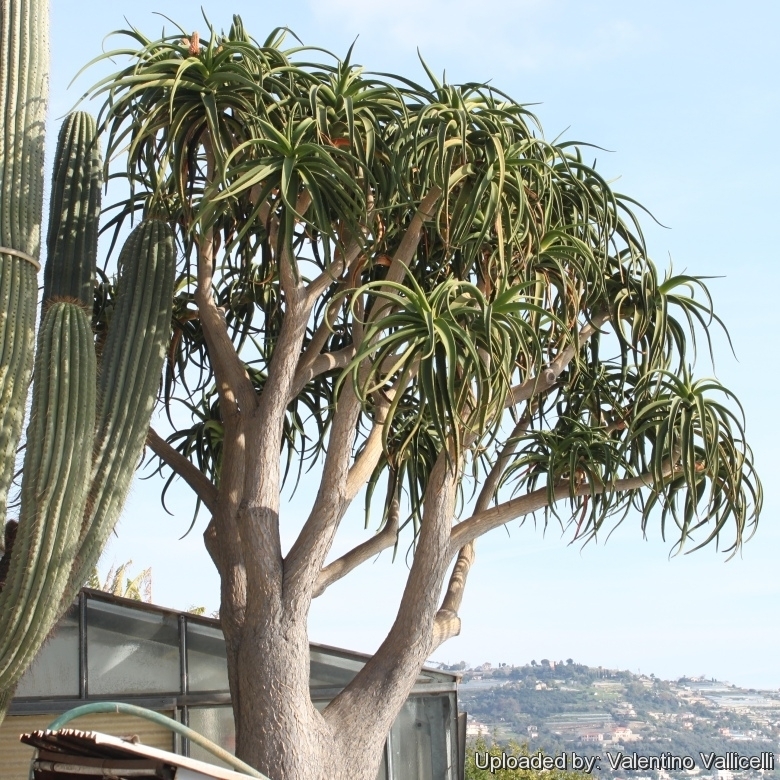 Gardening and landscaping: In mild climates Aloe barberae can be cultivated outdoors for use in landscaping, preferably planting it in hot and dry rock gardens. It forms a striking focal point in the garden, being an enormous sculptural tree with a neat crown. It will grow best in regions with a climate close to that of its native deserts – not too cold, and not too wet. Due to its massive stem base, it should preferably not be planted close to any buildings. It can be grown in large containers too. Medicinal uses: the juice is purgative. Propagation: It is easily cultivated from truncheons and smaller stem cuttings, as well as seed planted in autumn, in trays of coarse river sand. Cuttings must be dried out for at least 3 weeks before planting in river sand. Growing a mature plant from a seedling or single stem cutting would be a lifetime's work but by good fortune larger cuttings, sometimes known as truncheons with several branches and leaf-rosettes, can be rooted, but this may take several months and success is not always guaranteed.